Big advantage is good adjustable camera base. Disadvantage is that many factories made such stabilizers. Some of them have constant issues with gymbals and overall quality. 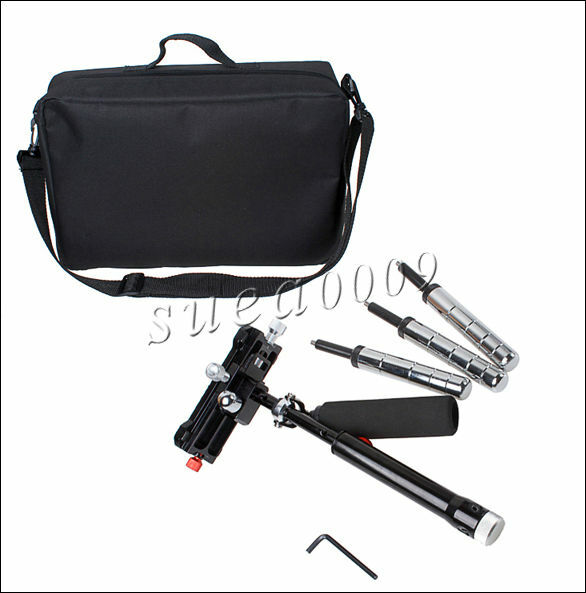 You can check http://www.personal-view.com/talks/discussion/5864/ifootage-wildcat-small-stabilizer#Item_32 for top quality steadicam with similar design. Thanks Vitaliy--I'm in for one. Problem is that I did not hear any issues reported by Skier in video from owners. In fact many factories make similar clones. iFootage make most expensive and best made ones. here we have chepest, but I did not heard bad reports about it. All the tests they do in the video are not equal. In the turning handle test notice how they twist the Skyler handle fast and the clone very slow. 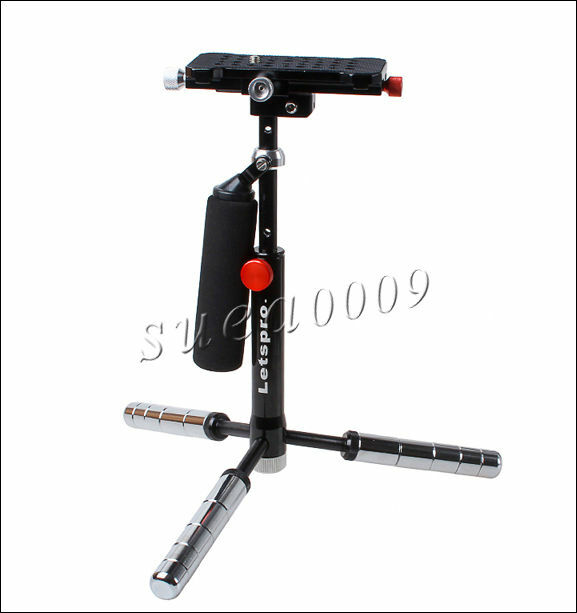 Any steadycam can be made to tilt by turning the handle slowly so gimbal friction has a chance to have effect. It appears they are only trying to put doubt in people's mind. Having a small amount of gimbal friction is good, it allows you to counter any unwanted rotation with slow motions of the wrist. Yeah, I can see they'd try to protect their sales by skewing the test! At this price, it's worth a try. Looks easier than trying to modify the steadicam smoothee. There might be minor differences and tolerances in build quality but its clear to see they are exaggerating them by hand holding. A truer test would be to mount both handles on a mechanical stand removing operator interference. Btw, it is usually hard to make bad gymbal for factories making such cheap stuff. As they are made on high performance equipment with big volume (hence lower prices). As far as I know market Chinese stabilizers now sell in volume that is about 10 times more than all old known brands combined. It's not rocket science, you can balance 2 forks on a glass no matter how bad they're made. Yet, all my DIY stabilizers were a futile effort! Advice given to Dustin Hoffman in The Graduate was one word: plastics. Today it's two words: chinese copies! It's really not the same thing. 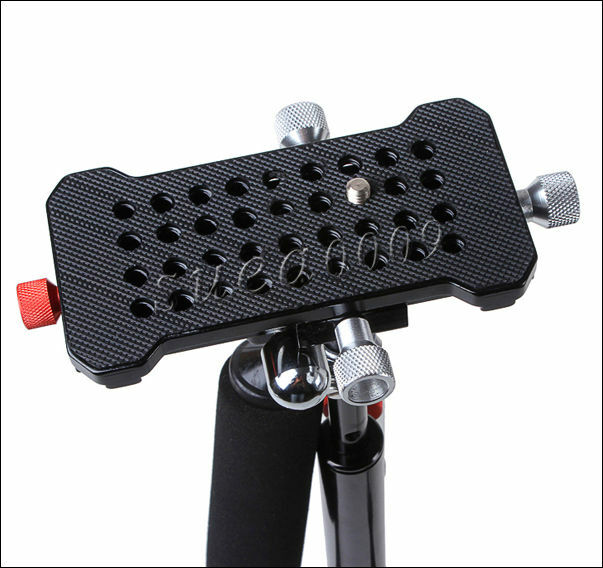 The three gimbals' axes needs to go through precisely the same point, at all angles and all levels of loading. If they don't, it won't stay balanced. The smaller and lighter the rig, the more precise it needs to be to perform well. Ok 3 forks on a glass then.. The reference wasn't meant to be taken literally. I agree with you, all three need to hit the same point but what I'm saying is it can be any materials and as rough as you like. All my DIY steadyCams work as good as my bought ones, but don't look so good to the client on a job. Well, I ordered one, so we shall see. @DrDave, have you gotten it yet? I'm thinking about getting one myself but the lack of reviews/videos is making me hesitant. I ordered it; I paid for it, and have of course heard nothing. However, I am more confident than if I had just thrown the money out of an office building window. Will report the instant it appears--unless it doesn't (hint of Eeyore). You mean DX item or ebay one? Update--with some trepidation, I opened the chat window in Deal Extreme, and they quickly located my order. Should be here in a few days. I'm already drinking heavily so I can properly test the stabilizer. @Vitaliy I ordered the DealExtreme one since it was cheaper and had the real fake logo in the fake picture. OK, I got it. Initial take is that it does not work very well, and looks different from the picture on the website. Main problem is the handle is very stiff, I will see if it can be loosened up. Right now, it is a not-so-steady cam. However, I have no experience with this particular model so I will give it a few days to burn in. Mine says "Letspro" on it, so it is probably the same as the eBay one, the one in the DHGate ad says "Depowers" and "Skyler" on the handle in the picture. And then adding a little more weight than the guide recommends, I would say it works OK. I understand that any of these things are tricky. Here's a few comments about my unit. The weights vary in weight a bit. So when you reassemble it, it won't be balanced unless you put the legs back in the same order. There are no clips holding the plate. So there is some wiggle room, just a bit. There are three adjustment screws, a fine tuner for a counterbalance, and the lock screw. The clips of the more expensive model would be nice. Several of the screws were bent a bit on my unit. The gimbal seems OK to me. Smooth, not super expensive smooth, but smooth. The whole thing is small and compact. The big weakness is that the handle joint is a bit rough. You can see that this is the cheapest parts, with a cheap screw and plastic. So occasionally it will throw you a curve ball. But sometimes it works fine. So all in all, I would prefer a more expensive one but this is OK. If I could mod the handle, or buy the more expensive handle as a part, I probably would go for that. Thanks for the update, @DrDave. Whenever you get more practice with it, it would be great to see some sample video. 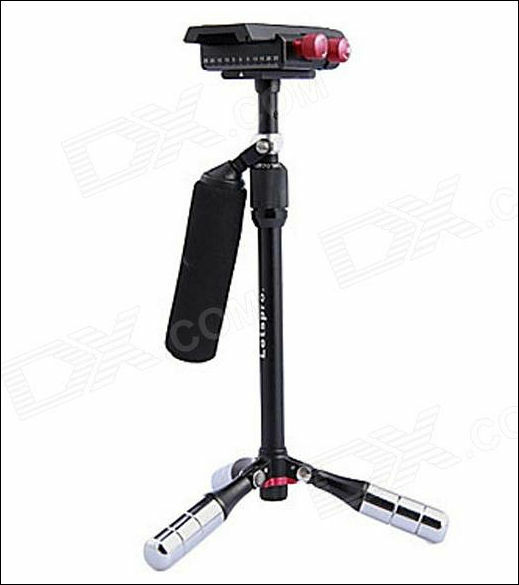 I got mine a couple of days ago, but I'm that newbie with this kind of stabilizers that I couldn't even get proper balance for my GH2+Noktor 12mm. I will keep trying. New version of XCAM Sabre stabilizer with adjustable gimbal. Another one, this time with folding legs (same $139 shipped price). Bummer. Should have waited for the folding legs.